Ajuga reptans... the bugleweed is a highly variable plant species. 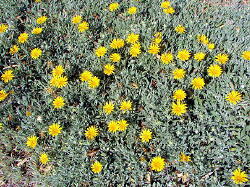 It is one of the best known and most useful ground covers, suiting many different situations and color schemes. Depending on the variety, the flowers may be rose or white, but the most commonly found color is a shade of purplish blue. The foliage color ranges from green to bronze to purple. There is also variegated forms available. (Ajuga reptans variegata is pictured below) Ajuga is evergreen to semi-evergreen, depending on the variety, and is hardy in USDA zones 3-9. The blooming period ranges from early spring up until mid July with the peak blossom period in May and June. 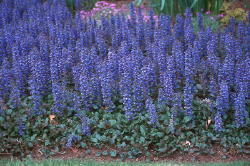 Generally, most types of Ajuga only reach a height of 6-9 inches when in full bloom. It grows along the ground, spreading by runners, and soon creates a thick carpet of foliage. Ajuga is excellent plant to use for erosion control due to it's extensive root system! Ajuga is a member of the mint family, and like most mints, its rapid growth rate may create problems. If this invasive attribute of Ajuga is a problem, it may be necessary to use some type of edging material to keep it within bounds. Ajuga tolerates a wide range of soil conditions as long as soil is well drained. The soil pH should be somewhere within the range of 3.7 to 6.5. It may be grown in any type of light from full sun to full shade. The leaves will tend to be smaller when grown in full sun, but the plant will produce more flower spikes. Ajuga prefers moist soil, but will tolerate drought remarkably well. Established plants should be set or transplanted in the garden in early spring. Plant them 12 to 15 inches apart, being careful not to plant too deeply. The crown should never be covered with soil or the plant will rot and die. 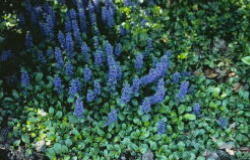 Ajuga is propagated by division, which can be done in fall or spring. The runners are easily removed from the mother plant when they are young. Removal of these offsets will become more difficult as they age, because they will become entangled in the main plant. It is a good idea to remove these runners periodically anyway, even if they are to be discarded. This will help to keep the plant contained. Pruning is done by either mowing or cutting the foliage back to the ground. About every third year, large, crowded groupings should be thinned out to reduce the chance of crown rot. 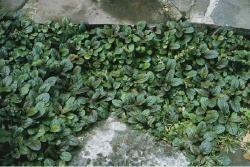 As non variegated foliage appears on variegated forms of Ajuga, it should be removed. This will prevent the plant from reverting back to it's original green form. Botanical: Dalea Capita "Sierra Gold"
OUTSTANDING FEATURES: Dalea capitata Sierra GoldTM is a cold-hardy, durable, attractive groundcover that produces an abundance of yellow flowers in the spring and fall. This plant forms a low, dense, bright green mound of foliage which provides a perfect backdrop for the clusters of light yellow flowers. The size, leaf color and flower production make this a highly desirable addition to any landscape. 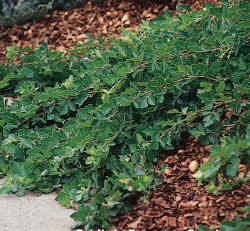 As an added benefit, the foliage has the scent of lemons when handled or crushed. Perhaps the foliage tastes bitter too, since rabbits seem to avoid it! In addition to tolerating temperatures down to 0°F, Sierra GoldTM also handles the full sun and reflected heat of the low deserts. DESCRIPTION: Dalea capitata Sierra GoldTM is a low-growing, spreading plant that grows to 8 - 12 inches tall by 3 - 4 feet across. It has bright green, fine textured foliage. Each leaf measures about 1 inch long and consists of 7-11 leaflets, each measuring about 3/8 inch long. The light yellow flowers are clustered into moderately dense spikes, which have up to 20-35 flowers and are about 1 inch long. CULTURE/MAINTENANCE: Sierra GoldTM is easily grown in the landscape. Plant in full sun for best results. It will grow in most soils without amendments. Sierra GoldTM grows well with a moderate amount of supplemental water from spring through fall. It has a fast growth rate, responding to the supplemental watering. This clone is hardy to 0°F without any damage. Plants are considered semideciduous and can be cut back about halfway in the winter. One drawback that has been noticed in Phoenix is their susceptibility to whiteflies. IDENTIFICATION: Dalea capitata Sierra GoldTM (trademarked by Mountain States Wholesale Nursery) is readily distinguished from all other cultivated Dalea species by the combination of size and flower color. 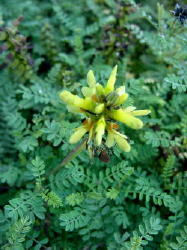 Currently there are no other low growing, yellow flowered Dalea species that have rich green leaves. LANDSCAPE APPLICATION: Sierra GoldTM can be used either singly or massed together to cover large areas. It looks good when used at the base of tall accents like Nolina matapensis, Nolina nelsoni, or Dasylirion longissimum. Its green foliage looks great in combination with Dalea greggii. It is also very attractive when tucked in between boulders in a rockscape. Because of its compact size and ability to tolerate reflected heat, Sierra GoldTM works well in narrow planters along walkways and in street medians. Plants have also been used successfully on golf course plantings. This groundcover is thriving in both Las Vegas and Palm Desert, demonstrating its adaptability to a wide range of growing conditions. PRECAUTIONS: Dalea capitata Sierra GoldTM is susceptible to whiteflies. There are no reports of this plant being attacked by any other insect pests. The flowers will attract some bees. As with all of the Daleas, be careful not to overwater, especially in soils with poor drainage. Gazania rigens is a species of flowering plant in the family Asteraceae, native to Southern Africa. The species occurs in South Africa and Mozambique. It is naturalised elsewhere and is widely cultivated as an ornamental garden plant. In Australia, where it is known as Coastal Gazania the species has become naturalised on coastal dunes and roadsides in the Central Coast and Sydney regions of New South Wales as well as the coast of South East Queensland. In South Australia it is found in the southern Mount Lofty area as well as on the Eyre peninsula. There are 3 currently recognised varieties: G. rigens (L.) Gaertn. var. leucolaena (DC.) Roessler. 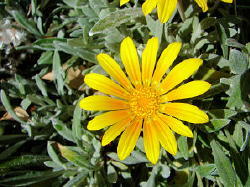 In cultivation, this variety is referred to as Trailing Gazania. G. rigens (L.) Gaertn. var. rigens This variety is only found in cultivation, where it is known as Clumping Gazania. It is distinguished by its large 4 to 8cm flower heads with yellow or orange rays, each with a basal eye-spot. G. rigens (L.) Gaertn. var. uniflora (L.f.) Roessler Gazania rigens is grown for the brilliant colour of its flowers which appear in the late spring and early summer. Plants prefer a sunny position and are tolerant of dryness and poor soils. 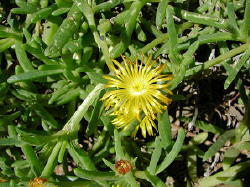 Malephora lutea, Fig - Marigold or Ice Plant Family ( Aizoaceae ), Rocky Point Ice Plant. Malephora lutea are creeping, with distinct internodes from which roots may arise. Leaf pairs are slightly fused at the base. Leaves are smooth-textured, bluish green, fleshy (succulent), soft and usually covered with a thick, waxy bloom that is easily rubbed off. Their showy flowers are golden yellow and occur singly. 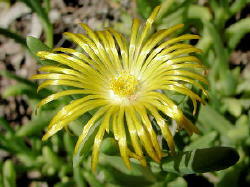 Ice plant belongs to the genus, Malephora, which consists of a dozen of species from South Africa. They need a lot of sun, but in very hot climates like Phoenix, in summer, they will need shade and regular watering for a part of the day in order to survive the summer. Height: Height about 8 inches. Spreading about 2 - 4 feet. Flowers: About 1 inch yellow..
Blooming Time: Mid March - April. Then occasionally during the late summer. Leaves: Evergreen, usually green, blue-green and fleshy. Opposite and slightly united basally, semi-hemispherical to cylindrical, smooth 1.5" long. Elevation: 0 - 2,500 Feet. Habitat: Full Sun. Dry Soil. A Xeriscape Landscape plant. Native to South Africa. Miscellaneous: Photos Taken; September 19, 2006. Boyce Thompson Arboretum. Botanical: Rhus Triobata "Autumn Amber"
18" x 6-8’ wide, (cutting propagated). "Autumn Amber" is a superb prostrate growing form of Three Leaf Sumac originally discovered years ago in Texas. Blooming in mid-spring with an amazing abundance of chartreuse colored flowers, the plants have attractive glossy green foliage that turns an amber-yellow in the fall. "Autumn Amber" is a welcome groundcover alternative to the creeping juniper. Developed in New Mexico at the Los Lunas USDA-NRCS Plant Materials Center. Grown in 5 inch deep premium pots Zones 4-8.